We'll start on the girls side of things. Winslow won the shuttle hurdles, 32.14, 4x200m, 1:45.17, and 4x400m, 4:04.89 on the way to their 41 point total and 15 point lead. Those 10 point wins were complimented by a third place finish in the high jump relay, a fourth place in the SMR, and a sixth place run in the 4x800m. The Toms River East girls won two field events. They threw a total distance of 73-05.5 to take the shot put relay, Rachel Lavigne 39-06 and Kacey Lombard 33-11.5. Then in the pole vault relay they had a total height of 17-06, Michele Meyers 9-00 and Alyssa Ott 8-06. 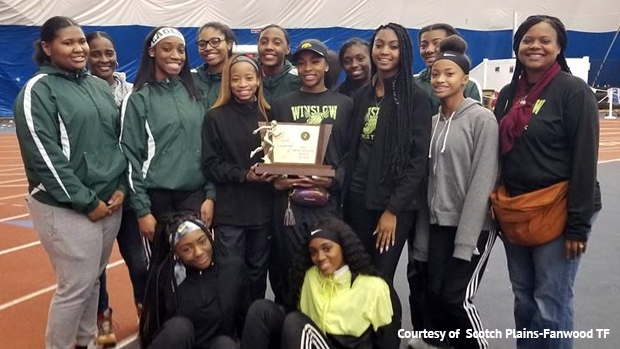 If Winslow ruled the sprints and hurdles then Colts Neck ruled the distance events, they won the DMR with a time of 12:33.60 NJ#4 and also took home the 4x800m at 9:52.68. 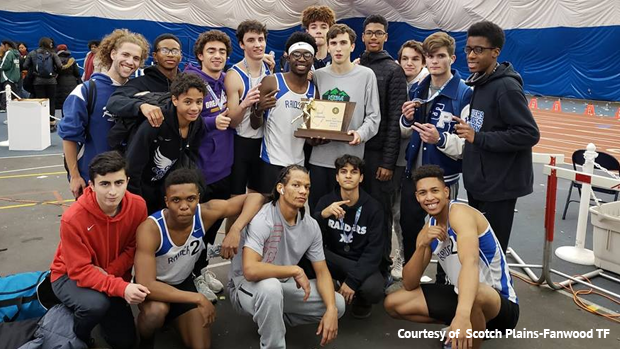 Now to the boys meet, Scotch Plains-Fanwood won their first State Relay team title in school history and they did so with gold medals in just one event. That one gold medal run was an important one, they entered the 4x400m up by 6.5 points and needed to place fourth or above to make sure Hamilton North couldn't pass them in the team scores even if they won the race. Well Scotch Plains said in their interview they never thought about settling for fourth, in their mind you race to win and after making up a ton of ground late in the race they did just that! They left no doubt about their team title crossing the 4x400m finish first at 3:30.82. Along with that win they gained second place finishes in the shuttle, 32.25, and distance medley 11:00.10. Were third in the pole vault, 22-06, fourth in the 4x200m at 1:35.42, and tied for sixth in the high jump 11-02. Hamilton North was second in the team score with 28 points. They won the shuttle hurdles, 31.38, and the 4x200m, 1:32.45. Summit had a strong run in the DMR clocking in a 10:55.68. Snyder found victory in the SMR running 3:44.99. There was also an exciting comeback in the 4x800m where Yarayah Hawkins split 1:56 to bring his team to first at 8:18.91. High jump was won by Middletown South with a total height of 12-02, Mark Anselmi over the 6-06 bar, Jonathan Nixon 5-08. Shot put went to Red Bank Regional with a total distance of 102-03.25, Brendan Loftus 54-02.5 and Ryan McCarthy 48-01. Hammonton took home the pole vault relay title at 24-00, Robert Gardner 12-06 and Luke McBrearty 11-06.